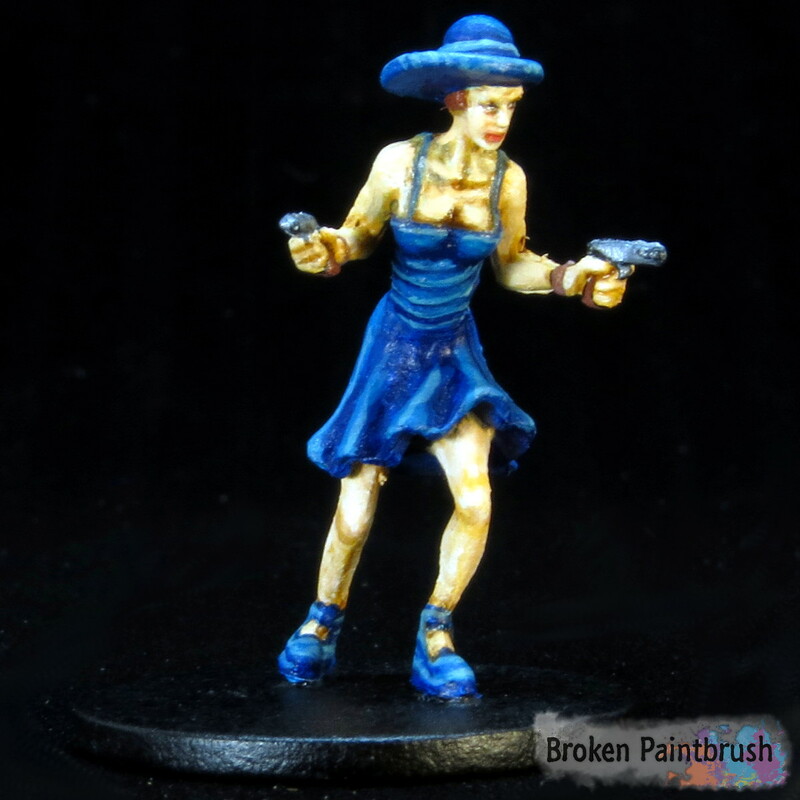 Jenny Barnes is one of the heroine investigators from Mansions of Madness board game. 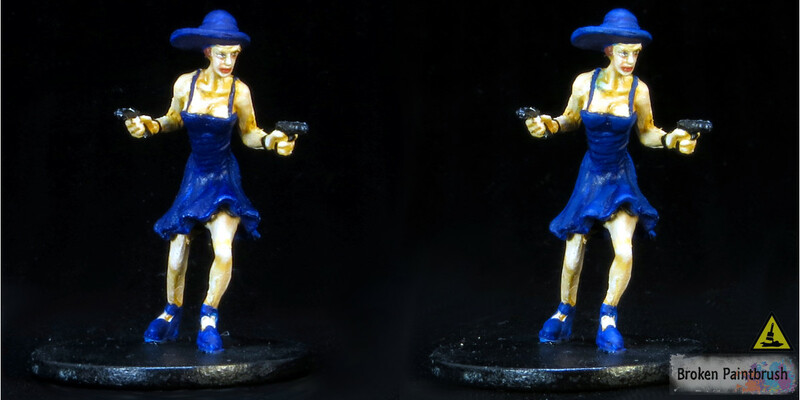 A pistol-toting flapper that hunts cultists and zombies in high heels and a tight dress. Rather than have her run around as gray plastic, I painted Jenny in her iconic blue outfit and gave her a fairly pale skin. Below I put together a tutorial on how to paint her. Don’t have time to read it all or want a nice, printable version? I also put together a PDF version, just jump to the bottom and fill in your email. 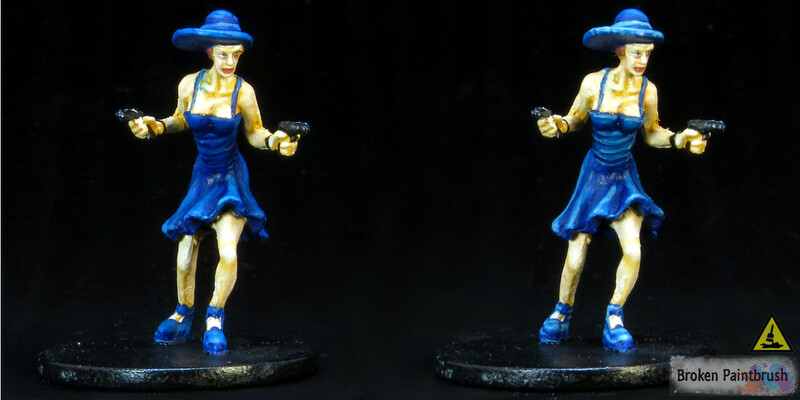 The models from Fantasy Flight Games are in relatively good condition for painting except for some mold lines (see the brim of her hat below). I used a hobby knife to scrape most of the lines off but as you can see I missed a few. 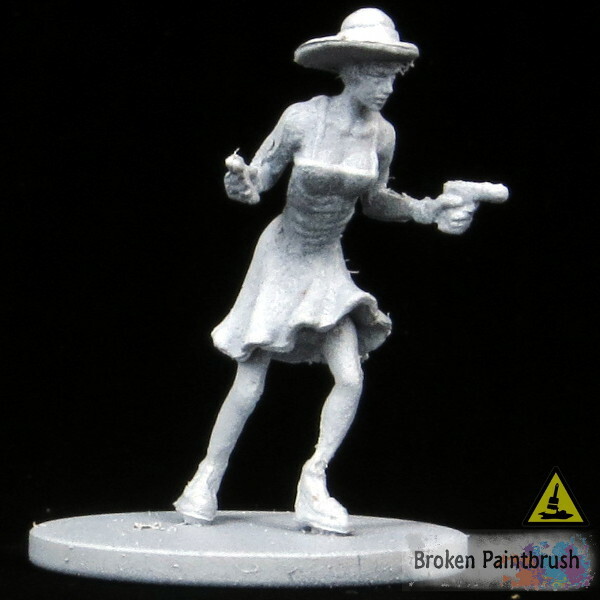 After priming with White Primer, she was ready to paint. The remaining mold lines (like her hat) were scrapped off as I painted and noticed them. The white primer allows for lighter skin and brighter blues. I wanted Jenny to be fairly light skin to contrast with her dark blue dress. All colors for the dress are from the Vallejo Skin Set, which provides a nice variation of skin colors to use. For the base color, I used Medium Fleshtone, which provides a nice warm base. 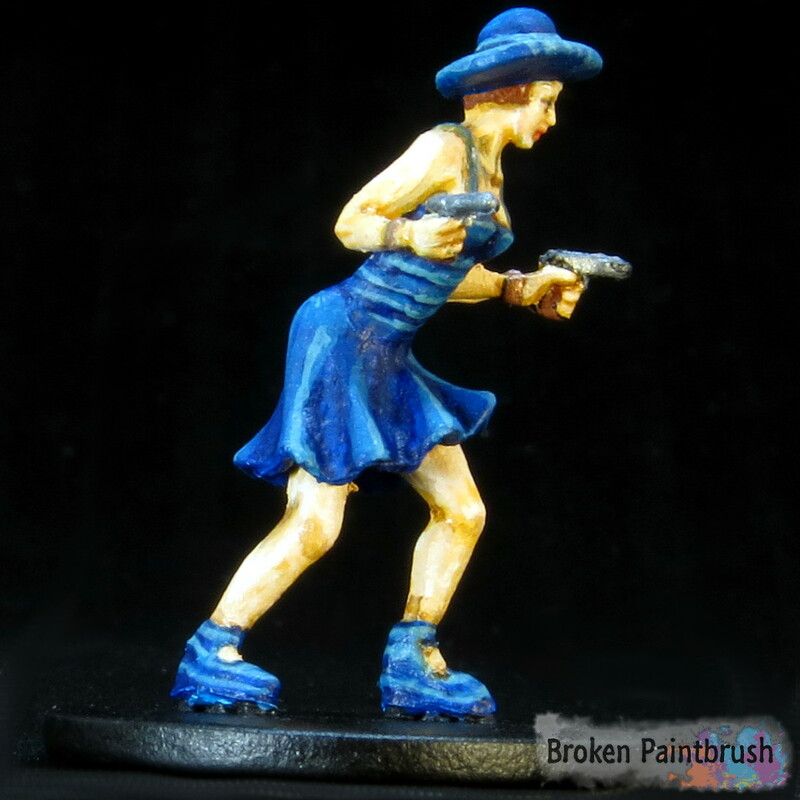 The rest of the model was also base coated with their primary colors (though I later changed the shoes and hat back to dark blue). Dark Flesh (which is oddly lighter than Medium Fleshtone) was used to highlight. Very little of the Medium Fleshtone was left visible. Finally, Basic Skin Tone was added, again leaving the previous colors only the recesses. To complete the highlighting Light Flesh was used on the upper areas of skin such as her shoulders, knees, and hands. A red wash was created using Red Vermillion and Airbrush Medium. It was used to color her lips without making them overly bright. Once the rest of the colors were finished, a Dark Brown Wash was used as a pin wash to create a stronger distinction between her dress and skin. By adding more Airbrush Medium, it doesn’t leave a strong tone, so a few layers were needed to accentuate her deeper recesses. It was also used to create artificial details around her knees and hands – the sculpting isn’t that detailed. 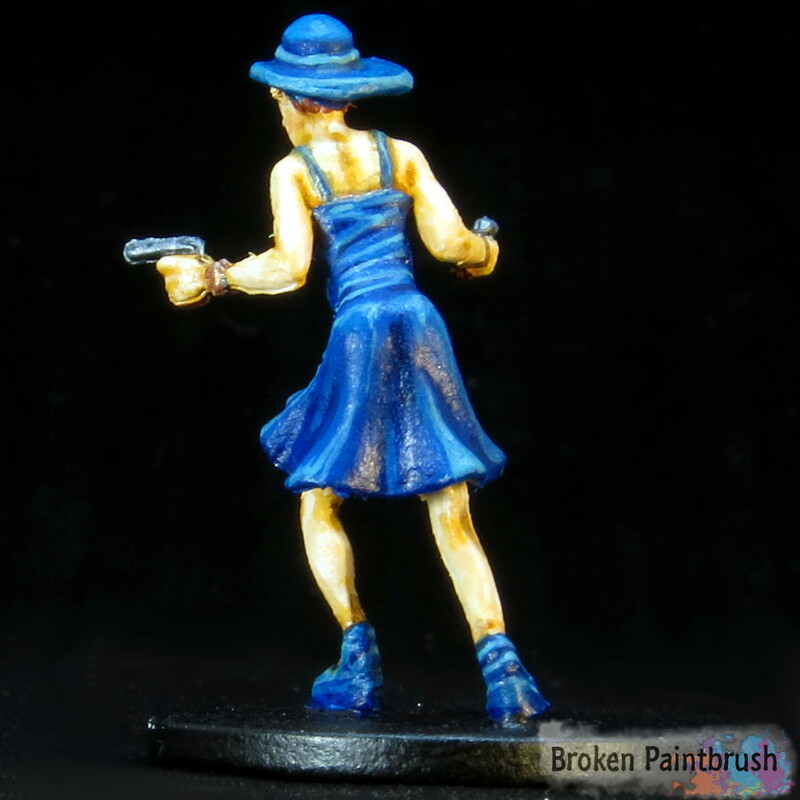 All of Jenny Barnes’ background shows her in a dark blue dress, hat, and shoes. While I started with changing her hat and shoes to white, they didn’t contrast enough with her light skin and I changed it back to blue. 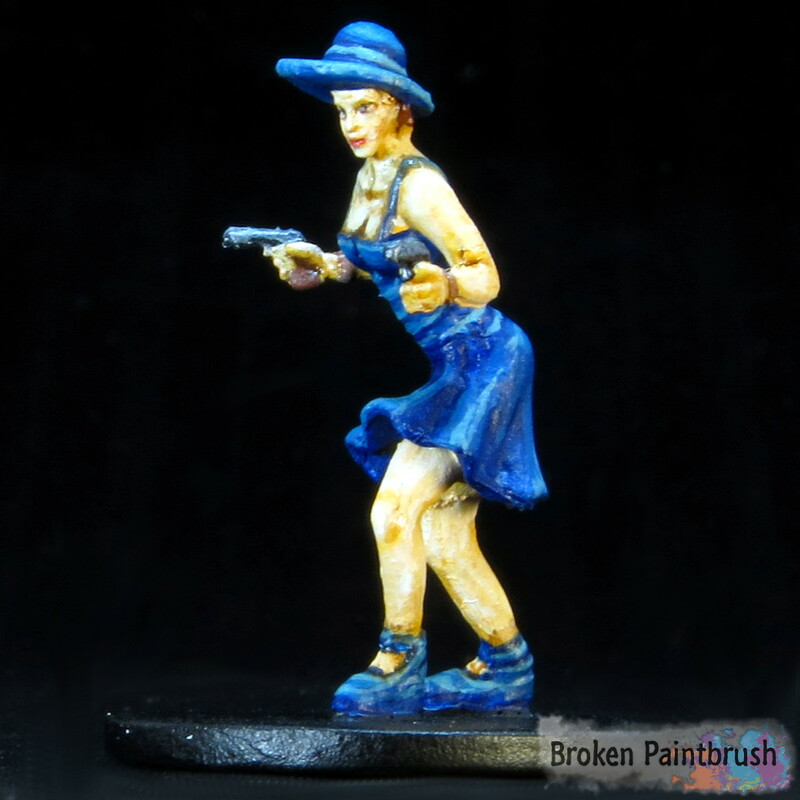 The clothes were base coated with Dark Prussian Blue. Her straps required a few back and forth clean ups with the BasicFleshtone to get it neat. The first highlight was a mix of two parts Model Air Blue and 1 part Model Air Pale Blue. The Model Air paints are a bit thinner than the Model Colors in the skin set, so a few layers were needed to provide a nice coverage for the highlights. For the top highlights, the mix was reversed with 1 part Model Air Blue and two parts Model Air Pale Blue. For some of the ridges along her abs and back, a forced highlight was needed to make up for the shallow sculpting. A final highlight of Pale Blue was used along the sharpest highlights. Jenny carries a pair of pistols in the game, offsetting her very feminine look. The guns were based with Black to give them a dark base. Model Air Gunmetal was used to provide the gun casing its metallic look. The Gunmetal is a relatively dark silver which works well with her pale skin. And finally, Model Color Mahogany Brown was used for the handles. A classy lady like this would have a classy pistol. To finish up, the base was retouched with black and a few coats of Matte Clear was used to seal in the paint. Having her painted will add another level to the game for sure! This finishes up the first Investigator of Mansions of Madness, so it’s back to more monsters. If you enjoyed this tutorial and want to save a copy, fill in the form below and I will send you a nicely formatted version of Painting Jenny Barnes. I will also keep you up to date on future tutorials from Broken Paintbrush.